PLAYA VISTA, CA--(Marketwired - December 07, 2016) - ​​With the release of a new Video Seller Trust Index (VSTI), ​​Pixalate​, ​the leader in fraud protection and data intelligence, today became the first company to provide a cross-platform rating system for video advertising, spanning programmatic TV, mobile and now desktop video. ​Expanding on its Global​ Seller Trust Index​™ (GSTI) and in-app ​Mobile Seller Trust Index​™ ​(MSTI), the ratings standard for programmatic advertising, Pixalate's new VSTI ​is a revolutionary index that ​​tracks the movement of video advertising spend from traditional direct channels to programmatic sellers, allowing advertisers for the first time to plan their campaign spend on platforms optimized for both inventory quality and cross-screen audience reach. New eMarketer research ​shows 2016 video​ ad spending will grow to $10.3 billion and its share of total digital spending will increase to over 14 percent. Connected TV/OTT video traffic is increasing at an average monthly rate of 18 percent, and an estimated 68 percent of internet users will be online via connected TV in 2017. Following the familiar patterns of online advertising spending, ad fraud follows the money and viewers while the industry races to catch up. Pixalate's data similarly finds that 44 percent of connected TV/OTT device traffic is invalid. By combining invalid traffic metrics with traditional video metrics such as audience reach and gross rating points (GRP) across all video mediums, Pixalate's VSTI provides a singular view of seller reputation and establishes a new currency for digital video advertising. "​Video advertising, particularly programmatic TV, is rapidly becoming the next big frontier for fraudsters to exploit​," said Jalal Nasir, founder and CEO, Pixalate. 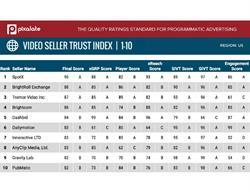 "Our​ groundbreaking new Video Seller Trust Index addresses this industry problem by identifying the safest platforms for advertisers to work with through quality scores that go beyond the one dimensional reach metric." "We're all too familiar with the growing fraud problem in video where we need to be particularly vigilant," said Jay Friedman, COO, Goodway Group. 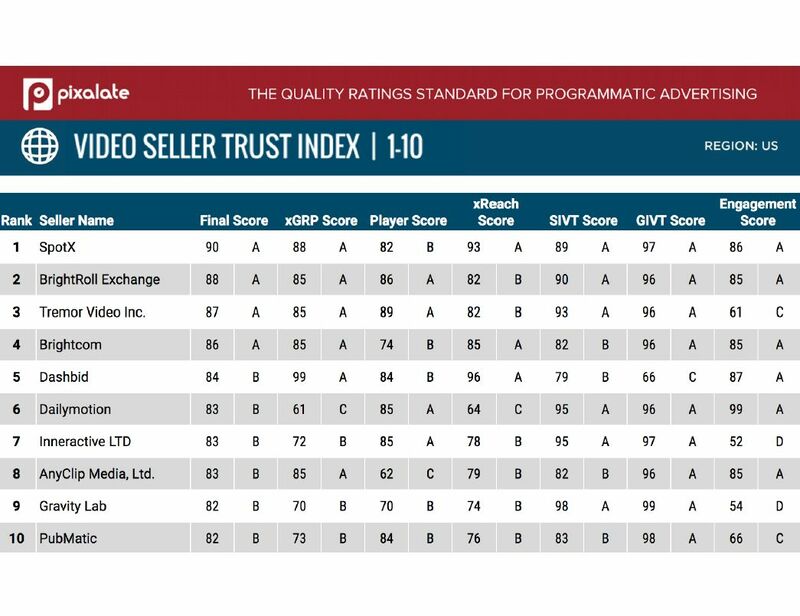 "With Pixalate's strong reputation as the programmatic advertising standard, we will be quick adopters of their new Video Seller Trust Index that measures the quality of video ad environments." xGRP: ​Pixalate's unique xGRP formula enhances the GRP standard by capturing the potential of an ad to reach the largest possible volume of users as distributed by device and via a given programmatic seller, with one common metric. xReach: ​A comprehensive measurement of a seller's ability to capture an advertiser's desired audiences across multiple video platforms as a percentage of the total available population. Player Size: ​Based on the percentage of large player (480 x 320 and higher), mid player (301 x 251 to 479 x 319), and small player (300 x 250 and smaller) video content optimized for device and screen size using industry standard sizes for each player class. Engagement: ​Based on user interaction with video content as measured by user interaction and other relevant video session data. Invalid traffic rates by type: Connected TV/OTT (44 percent); Mobile (37 percent); Desktop (35 percent); Tablet (32 percent). For Connected TV/OTT devices, Roku (59 percent), Sony Playstation (38 percent), and Nvidia Shield (31 percent) garnered the highest percentages of invalid ad impressions. Among mobile devices, the LG Risio (57 percent), ZTE Grand X3 (56 percent) and LG G Stylo (56 percent) had the highest mobile video ad fraud rates. Small player video represented 40 percent of all video impressions, and ad fraud for small player video exceeded 56 percent. To learn more about the methodology and download the October 2016 Video Seller Trust Index of top sellers, visit: http://www.pixalate.com/sellertrustindex.